Florida Sporting Clays is pleased to provide shotgun shooting classes to residents of Tampa and the surrounding communities of west central Florida. At Florida Sporting Clays, we believe that sporting clays provide a perfect opportunity to spend time in the beautiful Florida outdoors while participating in a fun, challenging sport that always leaves you coming back for more. Whether you’re looking to increase your shooting skills or just want to have a good time with a group of friends or co-workers, an outing with Florida Sporting Clays is sure to not disappoint. 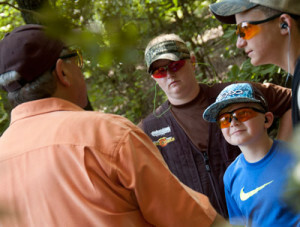 Our shooting classes are available to all individuals, even children. If you’re at least 10 years old and can properly wield a shotgun, we’d love to have you come shoot with us. We can accommodate single individuals as well as groups of several individuals. Our classes range from single one-hour lessons to multiple hours of fun shooting shotguns. To find out more about the shooting classes we offer at sporting clays courses and outdoor shooting ranges in the Tampa, FL, area, please contact Florida Sporting Clays today to inquire about instructor availability. No matter why you’re interested in shotgunning instruction, we ensure that you’ll have a blast and leave with significantly enhanced sport shooting skills.